I have the honour to submit a report on the operations of the Force under my command from 1st October, 1916, to 28th February, 1917. 1. During the months of October and November and the first half of December there were no important operations upon my Eastern front, though a successful reconnaissance against the enemy positions at Gebel El Rakwa and Maghara, 65 miles east of Ismailia, was carried out between the 13th and 17th October by a small force of Australian Light Horse, Yeomanry and Camel Corps. This operation not only needed careful preparation, but entailed two night marches over exceedingly difficult sand dune country, the difficulties being increased on the second night by the presence of a thick fog. On the early morning of the 15th the enemy was located holding a strong position on the high precipitous hills of Maghara. The force, attacking in two columns, dislodged the enemy from his advanced position, capturing a few prisoners. At the same time the enemy's camp was repeatedly bombed by our aeroplanes, which furnished invaluable assistance throughout the operation. After an engagement lasting two hours the force withdrew unmolested, and reached Bayud on the 17th without the loss of a single camel. The operation was well carried out, and valuable information was obtained regarding the enemy's dispositions and the nature of the country. With this exception all was quiet on the Eastern front. The unexpected evidence of our mobility given to the enemy by the successful reconnaissance against Mazar, which I recorded in my last despatch, and the losses suffered by the Turks during this affair, had given the enemy sufficient uneasiness to induce him to withdraw altogether from Mazar, and towards the end of October his nearest troops were in the neighbourhood of Ujret El Zol and Masaid, about seven and four miles west of El Arish respectively. The enemy also maintained various small posts in the neighbourhood of Maghara, with small garrisons further south at Hassana and Nekhl. About the same time the railway towards El Arish, which had been making steady and uninterrupted progress, was in the neighbourhood of Bir Salmana, some four miles east of Bir el Abd. The Australian and New Zealand mounted troops, with a force of Yeomanry attached, had advanced from Romani, and were covering the advance and the railway construction east of Salmana with brigades thrown out to their flanks and rear. 2. On the 23rd October, in order to be in closer touch with the civil authority, I moved my General Headquarters from Ismailia to Cairo, and at the same time the new Headquarters of the Eastern Force came into existence at Ismailia under the command of Lieutenant-General Sir Charles Dobell, K.C.B., C.M.G., D.S.O. At the same time the headquarters of the Inspector-General of Communications, which had always been in Cairo, were merged in General Headquarters, and on the lapse of his appointment Lieu tenant-General Sir E. A. Altham, K.C.B., C.M.G., to my great personal regret, returned to England. 3 The first half of November was mainly occupied in making the necessary arrangements for pressing forward our advance towards El Arish. In the south a small column under Brigadier-General P. C. Palin, C.B., marched on Sinn Bisher and Bir um Gurf, 30 miles south-east of Suez, on the 15th and 16th November, and attacked and drove off some enemy posted in the hills. During the latter part of the month the cavalry gradually pushed forward in advance of the railway, which by November 26th reached Mazar. Reconnaissances by mounted troops were pushed forward to within 8 miles of El Arish by 17th November, when the enemy's outposts were located at Jjret el Zol; on November 28th a mounted patrol was pushed through to Bir el Masmi, little more than 3 miles south-west of El Arish; and from this time our patrols were constantly in touch with the enemy's position at El Arish-Masaid. Throughout the month the enemy's aircraft showed considerable activity, attacking the railhead and the bivouacs of our advanced troops with bombs. Little damage, however, was done, and our own aircraft retained complete superiority in the air. The Royal Flying Corps in this month visited Magdhaba, Sheikh Zowaid and Khan Yunis for reconnaissance purposes, and on the 11th November made very successful bomb attacks on Bir Saba and Magdhaba. At Bir Saba special attention was paid to the aerodrome and the railway station, both of which were damaged. Presumably in retaliation for the air raid at Bir Saba one hostile aeroplane dropped bombs on Cairo on the 13th, causing some casualties among the civil population and killing one private; no other damage of a military nature was done. The Royal Flying Corps promptly replied by heavily bombing the enemy's camp at Magdhaba by moonlight on the same night. On the 17th November the enemy's camps at Masaid were heavily bombed by four machines in reply to' the appearance of a hostile machine at Suez the same morning. By the 1st December the railway was east of Mazar. During the first week of December constant patrols were sent out by the cavalry, and the country was thoroughly reconnoitred in the area Mazar-Risan Aneiza—Bir Lahfan— Bir el Masmi. In the meantime the enemy maintained his position of El Arish and Masaid, and in order to afford him no inducement to withdraw until such time as I should be ready to strike, mounted patrols were ordered to be as unostentatious as possible. 4. 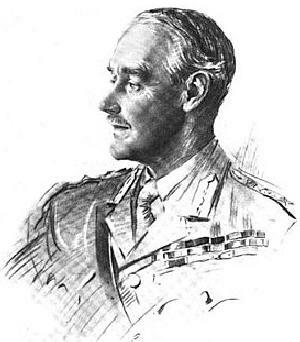 On the 7th December Lieutenant-General Sir P. W. Chetwode, Bt., C.B., D.S.O., assumed command of the Desert Column, shortly afterwards moving his Headquarters from Bir el Abd to Mazar. Since January the force had gradually pushed right across the Sinai desert, fighting when necessary, organising and constructing incessantly in the heavy sand and hot sun. The pressure on the enemy in other theatres and our success at Roman! were undoubtedly contributing factors to this advance, but the main factor—without which all liberty of action and any tactical victory would have been nugatory—was work, intense and unremitting. To regain this peninsula, the true frontier of Egypt, hundreds of miles of road and railway had been built, hundreds of miles of water piping had been laid, filters capable of supplying 1,500,000 gallons of water a day, and reservoirs had been installed, and tons of stone transported from distant quarries. Kantara had been transformed from a small canal village into an important railway and water terminus, with wharves and cranes and a railway ferry; and the desert, till then almost destitute of human habitation, showed the successive marks of our advance in the shape of strong positions firmly entrenched and protected by hundreds of miles of barbed wire, of standing camps where troops could shelter in comfortable huts, of tanks and reservoirs, of railway stations and sidings, of aerodromes and of signal stations and wireless installations, by all of which the desert was subdued and made habitable, and adequate lines of communication established between the advancing troops and their ever receding base. Moreover, not only had British troops laboured incessantly through the summer and autumn, but the body of organised native labour had grown. The necessity of combining the protection and maintenance, including the important work of sanitation, of this large force of workers, British and native, with that steady progress on the railway, roads and pipes which was vital to the success of my operations, put the severest strain upon all energies and resources. But the problem of feeding the workers without starving the work was solved by the goodwill and energy of all concerned. Moreover, organisation kept pace with construction. The equipment of the fighting units with camel transport, which had reached its first stage of completion at the time of the Romani battle, had been perfected by the middle of December, the allotment of camels to units having been worked out with the minutest precision. A large number of additional camels were provided for convoying supplies and water from the railhead to the front. The striking force was now completely mobile, and the troops had grown skilful in meeting the special problems of desert campaigning. The Turkish garrison at El Arish consisted of some 1,600 infantry in all, in a strong entrenched position. Between the 9th and 14th December increased activity was shown by the Turks, and our aircraft and mounted patrols reported the construction of new works, while the enemy camps at Magdhaba and Abu Aweigila were reported to have increased m size. On these indications of a probable reinforcement to the enemy, the final preparations were pushed on with most strenuous determination. Had rain only fallen, an earlier move could have been made, but as it was, the water supply for the striking force was not adequately secured till 20th December. 6. The swiftness of our final preparations was rewarded, but not immediately, by a successful engagement. We had been too quick for the enemy, but he had recognised it, and, knowing that reinforcements would arrive too late, had hurriedly withdrawn his troops from Masaid and El Arish. This retirement was reported by the Royal Flying Corps on the 20th December, and the Australian and New Zealand mounted troops and Imperial Camel Corps were ordered to move on El Arish the same night. Scottish troops were to move in support of the mounted troops. Accordingly, after a skilfully conducted march of twenty miles in the moonless night, the Australian Light Horse and the Imperial Camel Corps surrounded the enemy's position. Light Horse patrols reached El Arish about sunrise, and found it unoccupied. By 7.20 a.m. the Light Horse were east of El Arish, the Imperial Camel Corps south of the town, another party of Light Horse was about Masaid, and the New Zealand Mounted Rifles were at Masmi. During the day our aircraft reported about 1,600 of the enemy on the march in two columns in the neighbourhood of Magdhaba and Abu Aweigila. Sheikh Zowaid and Rafa appeared to be clear of the enemy. Maghara had been evacuated, and the enemy was apparently in process of withdrawing from the neighbouring posts. By the night of the 21st December, therefore, the re-occupation of El Arish had been effected, and the enemy was evacuating, or had evacuated, his positions west of a north and south line through that place, except those at Nekhl and Hassana. The aircraft, moreover, reported that the garrison of the latter place seemed also to be reduced. On the 22nd December the Scottish troops were about El Arish and Bittia. Mine-sweeping operations were at once commenced in the roadstead under the direction of Captain A. H. Williamson, M.V.O., R.N., while the erection of a pier was taken in hand. In forty-eight hours the roadstead was cleared of mines, and the supply ships from Port Said began unloading stores and supplies on the 24th. Supplies were also hastened to El Arish by camel convoy, since it was of the utmost importance to accumulate at once a sufficient amount to give our mounted troops a further radius of action. Our aircraft were exceedingly active during the day A successful attack was made on the railway bridge at Tel-el Sharia, north of El Arish, El Auja and Bir Saba were effectively bombed, and two battalions of Turkish, troops located by the Royal Flying Corps at Magdhaba, some 20 miles south of El Arish, were attacked with bombs by thirteen of our aeroplanes and suffered many casualties. In order to emphasise the capture of El Arish, in the Southern Canal area a column assembled near Bir Mabeiuk on the 22nd December, and on the following days advanced through the Mitla Pass and by the Darb el Haj as far as Sudr El Heitan, more than half-way to Nekhl. This column destroyed various enemy posts and entrenchments, but, finding no enemy, returned on the 25th. 7. The enemy having temporarily succeeded in eluding us, it was of the utmost importance to strike any of his forces that remained within our reach. I had always anticipated that, should the enemy choose to abandon El Arish, his line of retreat would be through Magdhaba and Abu Aweigila towards El Auja. These anticipations were confirmed by the report of the Royal Flying Corps that an enemy force of about two regiments was at Magdhaba. It appeared likely that this force consisted of the 1,600 infantry which had composed the garrison of El Arish, and that it was preparing to hold Magdhaba as a rearguard. Orders were given that a mounted force should push forward with all haste against the enemy, and arrangements were made accordingly by General Sir Charles Dobell for the move of most of the Australian and New Zealand mounted troops, with the Imperial Camel Corps, against Magdhaba and Abu Aweigila on the night of the 22nd-23rd. Major-General Sir H. G. Chauvel, K.C.M.G., C.B., was in command of the column. 8. Starting at 12.45 a.m. on December 23rd, the flying column halted at 4.50 a.m. in an open plain about four miles from Magdhaba, whence the enemy's bivouac fires could plainly be seen. General Chauvel, with his staff and subordinate commanders, immediately undertook a personal reconnaissance of the enemy's position, and soon after 8 a.m., by which time the first aeroplane reports had been received, the attack was set in motion. The enemy had taken up a position on both banks of the Wadi el Arish, and was very strongly posted in a rough circle of from 3,000 to 3,500 yards diameter. Five large closed works, exceedingly well sited, formed the principal defences, and between these works was a system of well-constructed and concealed trenches and rifle pits. The New Zealand Mounted Rifles and Australian Light Horse, both under the command of Brigadier-General E. W. C. Chaytor, C.B., were to move to the east of Magdhaba and to swing round to attack the enemy's right and rear. The Imperial Camel Corps were to move direct against Magdhaba to attack the enemy in front—that is, from the north-west. Other Australian mounted troops were at the outset in reserve. Between 8.45 a.m. and 9.30 a.m. the attack developed, and at the latter hour General Chaytor moved a Light Horse Regiment and part of a Machine Gun Squadron on a wide turning movement round the rear of the enemy's position with orders to come in from the south. A little later two regiments of the New Zealand Mounted Rifles were despatched in more or less the same direction, though making a less wide detour, with orders to move on 'Magdhaba from the east. In the meantime the Imperial Camel Corps wore making progress, though somewhat slowly. At 10 a.m., the aircraft reports indicated the possibility that the enemy might try to escape. Thereupon General Chauvel ordered the mounted troops in reserve, less one regiment, to push in from the north-west. The troops moved forward at a trot, and, coming under shrapnel fire, increased the pace to a gallop. The enemy then opened a very heavy rifle and machine gun fire, whereupon the force swung to its right and gained cover in the Wadi where, dismounting, it began an attack against the left of the enemy position. Between noon and 1.30 p.m., the enemy's position was practically surrounded, but for some little time it had been found increasingly difficult to make progress. The horse artillery batteries had been greatly hindered by the' mirage and the difficulty of getting forward observation, the ground round the enemy's position being absolutely flat and devoid of cover. In the meantime reports were received from the Field Squadron that no' water could be found. Unless Magdhaba could be taken during the day, therefore, it was probable that our troops would have to withdraw, as none of the horses had been watered since the evening of the 22nd, and the nearest water, except that in the enemy's position, was at El Arish. General Chauvel reported the situation to the Desert Column accordingly, and received orders to maintain the attack. But before this communication arrived the situation had begun to improve. Some Australian mounted troops, pressing on against the enemy's left, captured a work on the west of the Wadi, taking about 100 prisoners. At 2 p.m. two regiments of the Australian Light Horse coming in from the north-east, were within 200 yards of the position, in close touch with the Imperial Camel Corps advancing from the north-west. A quarter of an hour later the attack of a third regiment of this force was pressing heavily on the enemy from the south. By three o'clock the New Zealand Mounted Rifles were within 600 yards of the enemy's trenches on the east. From this time forward the pressure on the enemy increased from all sides. Before half-past three the force from the Wadi and the Imperial Camel Corps attacked the second line of the enemy's trenches, and at four o'clock the former carried one of the main redoubts, taking 130 prisoners, including the Turkish Commander. Immediately after this, part of a Light Horse Regiment charged in from the south, mounted and with fixed bayonets, and by half-past four all organised resistance was over, and the enemy was surrendering everywhere. The total number of prisoners taken in this-, fine action was 1,282, including some 50 wounded. A large number of the enemy were buried by our troops on the position. Four mountain guns, one machine gun and 1,052 rifles were captured, and 200 more rifles were destroyed. Our own casualties were 12 officers and 134 other ranks killed and wounded. It was possible to give every attention to our wounded before moving them back to El Arish, owing to the fact that the enemy had a permanent and well equipped hospital at Magdhaba, to which they were taken as soon as the action was over. The troops marched back to El Arish during the night of December 23rd-24th. 9. On 27th December the Royal Flying Corps reported that an entrenched position was being prepared by the enemy at Magruntein, near Rafa. Work on this position was continued during the following day, and it was occupied by a garrison equivalent to about two battalions with mountain guns. It was not at the moment possible for me, owing to difficulties of supply, to push on and occupy Rafa permanently. Since, however, the enemy had again placed a small detached garrison within striking distance of my mounted troops, I determined, if possible, to repeat the success at Magdhaba by surrounding and capturing the Magruntein position also. On 7th January I communicated this decision to General Dobell, who entrusted the operation to Lieutenant-General Sir Philip Chetwode, Bt., C.B., D.S.O., commanding the Desert Column, who set out from El Arish on the evening of the 8th-9th with a force consisting of Yeomanry, Australian and New Zealand mounted troops, and the Imperial Camel Corps, with a battery of artillery attached. So efficiently and swiftly was the approach march carried out that the enemy was completely surprised, and by dawn on 9th January his position was almost entirely surrounded before he became aware of the presence of any large forces in his vicinity. The position, however, was a formidable one. It consisted of three strong series of works connected by trenches, one series facing west, one facing south-west, and one facing south and southeast. The whole was dominated by a central keep or redoubt, some 2,000 yards southwest of Rafa. Moreover, the ground in front of these works was entirely open and devoid of cover, and in their immediate neighbourhood was almost a glacis. The guns, with which aeroplanes were cooperating, started to register at 7.20 a.m. The main attack, to be carried out by Major-General Sir H. G. Chauvel, K.C.M.G., C.B., General Officer Commanding Australian and New Zealand Mounted Troops, was timed for 10 a.m., with the New Zealand Mounted Rifles on the right, attacking from the east, some Australian Light Horse on their left, attacking from the east and south-east, while the Imperial Camel Corps attacked the works in their front from the south-east. A body of Australian Light Horse were in reserve and the Yeomanry in column reserve. Shortly after 10 a.m., parties of Turks, who were attempting to leave Rafa by the Khan Yunus road, were met and captured by the New Zealand Mounted Rifles, who galloped the Police barracks and Machine Gun post, capturing six Germans (including one officer), two Turkish officers, and 163 other ranks. Before 11 a.m., Rafa was occupied, and two regiments of the troops in reserve were advanced against the works on the left of the troops attacking from the east and south-east. Some Australian Light Horse and the Camel Corps were ordered to press their attack on the works facing south-west, and about the same time the remainder of the New Zealand Mounted Rifles, with a body of Light Horse, galloped an open space south of the Police post, and established themselves 300 yards east of the nearest enemy work. The Yeomanry were also ordered to deploy against the western works and to attack in conjunction with the Camel Corps. The encircling movement was now practically complete, save for a gap in the north-west between the New Zealand Brigade and the Yeomanry. At 12.20 p.m. one of the Horse Artillery batteries moved forward some 1,500 yards to support the attack of the Yeomanry. By 1 o'clock our troops were within 600 yards of the southern and western trenches, which were being shelled with good effect by our artillery. By 2 p.m. the right of the New Zealand Mounted Rifles had linked up with the left of the Yeomanry, and was pressing its attack on the rear of one of the enemy's works. General Chetwode now issued orders for a concerted attack on the "Redoubt," or central keep, by the New Zealand Mounted Rifles, and all other available troops of the Australian and New Zealand mounted force, to commence at 3.30 p.m. The Yeomanry was ordered to co-operate against the rear of the work. By 3.15 p.m. two of the enemy's works had been captured and further prisoners had been taken. While the attack on the central redoubt was developing, information was received, both from patrols and from the Royal Flying Corps, that an enemy relieving force was marching from Shellal on Rafa. This force was attacked frequently with bombs, and machine gun fire by our aeroplanes with success. General Chetwode did not allow this threat, which complicated his situation, to affect the execution of his purpose. He at once gave orders for the attack to be pressed with vigour. The troops, admirably supported by the artillery, advanced with great gallantry, and at 4.45 p.m. the New Zealand Mounted Rifles captured the redoubt with brilliant dash, covering the last 800 yards in two rushes, supported by machine gun fire. By this achievement they were able to take the lower lying works in reverse, and these soon fell to the Camel Corps, the Yeomanry, and the Australian Light Horse. By 5.30 p.m. all organised resistance was over, and the enemy's position with all its garrison was captured, while a detachment of the Australian Light Horse, which had come in contact with the force marching from Shellal, drove off the enemy without difficulty. Our troops now withdrew, taking with them all prisoners, animals and material captured; one regiment and a light car patrol, which were left to clear the battlefield, withdrew unmolested on the following day. In this fine action, which lasted for ten hours, the entire enemy force, with its commander, was accounted for. More than 1,600 unwounded prisoners were taken, including one German officer and five German non-commissioned officers. In addition, six machine guns, four mountain guns, and a number of camels and mules were captured. Our casualties were comparatively light, amounting to 487 in all, of which 71 were killed, 415 wounded, and one was missing. 10. The result of these successful operations was that the province of Sinai, which for two years had been partially occupied by the Turks, was freed of all formed bodies of Turkish troops. The destruction of his rearguard at Magdhaba compelled the enemy to withdraw from Maghara, Hassana and Nekhl, all of which were clear by" the 31st December, and the victory at Magruntein had driven him over the frontier at Rafa, which he did not attempt to reoccupy. For this achievement I am greatly indebted to Lieutenant-General Sir Charles Dobell, K.C.B., C.M.G., D.S.O., and his Staff for their unremitting efforts during the whole period to make our advance, as it was, rapid and decisive. To them are mainly due the excellent organisation and dispositions which ensured success without delay, and, above all, the perfection of arrangements for maintaining the troops in a waterless district far ahead of the railway, without which the dash and endurance of our troops would have been of no avail. The foresight, rapid decision and excellent arrangements of General Sir P. Chetwode and the Staff of the Desert Column, the skilful leadership of General Chauvel, the cheerful endurance by the troops concerned of the fatigue and hardships entailed by the Magdhaba operations, and their gallantry and dash at Magruntein, are also worthy of the highest praise. During the actions the work of the Royal Flying Carps in co-operation with the mounted troops was admirable. Not only were the enemy harassed with bombs and machine gun fire throughout, but the aircraft reconnaissance was as reliable as it was untiring. General Chauvel and General Chetwode were kept constantly and accurately informed both of the enemy's movements and of the progress of their own widely dispersed troops, and the co-operation of the aircraft with the artillery was excellent. During the engagement at Magruntein the Royal Flying Corps, besides attacking the entrenched enemy and his relieving column, made a very successful raid on Bir Saba. 11. As a result of the action near Rafa the enemy immediately began to concentrate his forces near Shellal, west of which place he began rapidly to prepare a strong defensive position near Weli Sheikh Nuran, with the object of covering his lines of communication and supply along the railway running into Bir Saba from the north, and along the Jerusalem—Hebron—Bir Saba road. The preparation of this position has continued up to the present date. During the earlier portion of January considerable activity was shown by the enemy's aircraft, both in reconnaissances and small bombing raids. On the other hand, the effect of our recent success on his moral was proved by the very marked increase in the number of deserters who came into our lines. In the meantime arrangements had been progressing with a view to the concentration of additional troops towards El Arish. In general, the period following the action at; Magruntein was, on my eastern front, devoted to preparations for a further advance. Invaluable work was done during this period by the Royal Navy in transporting and landing supplies from the sea at El Arish. The coast is exceptionally unfavourable for operations of this kind, owing to strong currents, a shelving and shifting beach and heavy surf. Nevertheless, owing to the whole-hearted co-operation of Vice-Admiral Sir R. E. Wemyss, K.C.B., C.M.G., M.V.O., and those under him, a large amount of stores and supplies was landed. Before the end of the month the railway station at El Arish was completed. 12. During the month of February, on the eastern front, the railway, in spite of many difficulties, owing to the heavy sand, was gradually pushed out along the coast. The period generally was devoted to the perfection of the El Arish position, and to energetic training of the troops. Our cavalry patrols kept the country up to and beyond Rafa continuously under observation, and steps were taken to bring in the local Bedouins. On 23rd February, information having been received that Khan Yunus had been evacuated, a reconnaissance was carried out against that place by the New Zealand Mounted Rifles. The column, arriving at dawn, found the position strongly held, and, after manoeuvring the enemy out of his front line of defence and capturing prisoners, withdrew without difficulty. Continuous pressure maintained by our troops in this neighbourhood, however, induced the enemy to withdraw the garrison of Khan Yunus, which was entered by our cavalry without opposition on 28th February. During the month also a successful minor operation was carried out in the interior of the Sinai Peninsula. Information having been received that the enemy had re-established small posts at Hassana and Nekhl, with the object of regaining his prestige in the eyes, of the Bedouins, I ordered a combined operation, against those two places to be undertaken by three mobile columns of cavalry and camelry one column starting from El Arish against Hassana and two starting from Serapeum and Suez respectively, against Nekhl. The advance was so timed that all the columns should arrive at their destinations at dawn on 18th February. The column from El Arish surrounded Hassana by daybreak on, the 18th. The garrison of three officers and nineteen other ranks at once surrendered without resistance. The town was searched, and a few camels, twenty-one rifles and 2,400 rounds of small arms ammunition were found. The northernmost of the Nekhl columns, leaving Zogha (some twenty-three miles east of the Great Bitter Lake), which was its point of concentration, marched through the Baha Pass to Themada, twenty-five miles north-west of Nekhl, where it arrived on the 16th. On the following day a patrol sent forward towards the Nekhl-Hassana road was fired on from the hills, and in the afternoon it was further reported that the road was clear and that men could be seen leaving Nekhl in an easterly direction. The advanced patrol captured four of the enemy and ten camels, but was prevented from crossing the plain east of Nekhl by rifle fire from about fifty of the enemy who had temporarily halted in the foothills on the Nekhl-Akaba road. Nekhl was entered that evening by a squadron of the Australian Light Horse, who captured two Bedouins and one Turk, the town being otherwise empty. Further pursuit of the enemy was impossible owing to darkness, and the remnants of the garrison were able to make good their escape eastwards along the waterless road towards Akaba. The main body entered Nekhl at dawn on the 18th, and the Southern Column from Suez reached the town at 9 a.m. The latter column, which included detachments of Indian infantry, had marched from Abu T'if (20 miles south-east of Suez) through the difficult Bir Abu Garad Pass to Ain Sudr, and thence to Nekhl. The total captures at Nekhl were eleven prisoners, one field gun, a number of rifles, 16,000 rounds of small arms ammunition, 250 rounds of gun ammunition, and a quantity of stores and explosives. These well-executed and carefully organised operations gave one more proof to the enemy of the mobility of our mounted troops, .and of their power to strike over considerable stretches of waterless desert. The excellent arrangements for the Nekhl operation reflect great credit on Brigadier-General P. C. Palin, C.B., and his staff. 13. During most of the period under review the Western Front has been quiet. My advance to the Baharia and Dakhla Oases was accomplished without opposition, and the subsequent task on that front was that of policing its large area and guarding against the possibility of further raids on the part of the Senussi. On 4th October Major-General W. A. Watson, C.B., C.I.E., took over the command of the Western Force. By this date a column had already been concentrated at Shusha, three miles west of Samalut, for the purpose of conducting operations in the Baharia Oasis. A few days later, however, reliable intelligence was received to the effect that Sayed Ahmed, who had already left the Dakhla Oasis for Baharia, had left Baharia for Siwa on 9th October, the majority of his force preceding him, the rearguard following on the next day. It is probable that the news of my impending advance and the sickness and lack of food in the oasis, which impaired the moral of his troops, were deciding factors in determining his retreat. An immediate endeavour to intercept the enemy's rearguard was made by concentrating all available light armed cars wrest of Baharia, but the distance to be covered and the sandy nature of the country prevented the success of the attempt. Small mobile columns were at once pushed into the oases of Baharia (110 miles west of Samalut) and Dahkla (75 miles west of Kharga), and all the enemy who had not accompanied the retreat, some 300 in number, were captured with little resistance. The Harra wells on the edge of the Baharia Oasis were captured by a detachment of the Imperial Camel Corps on the 17th, and on the 19th a detachment of the same corps entered the oasis and took possession of the villages of Harra, Mendisha, Bawitti, and Kasr. This oasis was soon completely in our possession, and the Baharia railway commenced receiving traffic. A Light Car Patrol and a detachment of Imperial Camel Corps, starting from Kharga, covered 70 miles of desert .and occupied Tenida, in the Dakhla oasis, by the 17th. The light cars pushed on to Budkulu, capturing a tabur of 45 men and ten camels, and on the 19th the Camel Corps detachment reached Bir Sheikh Mohammed, five miles west of Kasr Dahkla, and captured 40 more prisoners. From the 20th to the 22nd a thorough "drive" was made of the oasis, with a systematic search of the villages, which resulted in the capture of 50 more of the enemy, besides many political prisoners. By the end of the month the oasis was entirely clear of the enemy. During the following month permanent garrisons were established in these two oases. The Baharia garrison marched out on 6th November and encamped on the escarpment at Legalit Gate, where a very healthy site has been found. The inhabitants, who were undoubtedly glad to be rid of the Senussi, all turned out to welcome the troops, and so far throughout the oasis the latter have always been well received. General Watson himself visited the oasis on 16th November and held a durbar on the 17th at Bawitti, which was attended by the Omdas, Sheikhs and principal inhabitants. The Union Jack was hoisted in the presence of a guard of honour. On 15th November a patrol left Legalit to reconnoitre the Farafra Oasis. The town of Farafra was entered on the 19th. All Senussi followers were separated from the inhabitants, and a search made for arms, with the result that 18 Senoussi prisoners and 12 rifles were taken. The patrol left Farafra on the 20th. During December General Watson visited Dakhla and held a durbar on the 19th. The task of re-instituting civil administration in both the Baharia and Dakhla Oases has now been taken over by the civil authorities, to the gratification of the inhabitants, and trade is being encouraged as much as possible. In the other sections of the western front the work done by the light and armoured cars, owing to the dash and enterprise of their officers, has been uniformly excellent. They are the terror of all the ill-disposed in the Western Desert, and to them, as much as to any, is due the satisfactory state of things which exists throughout from the coast down to the Fayum. The geographical information obtained by these patrols is also invaluable. 14. During October, under the direction of the Italian authorities, a combined British and Italian naval reconnaissance was carried out at Ageila, thirty-two miles west of Tobruk, where a large camp of followers of Idris and Nuri, with guns and a quantity of ammunition, was reported. The camp was shelled, serious casualties being inflicted. On 27th October a light armoured car patrol, accompanied by Lieutenant T'escione, of the Italian Army, reconnoitred an enemy camp at Zowia Jansur, the Muhafzia holding the camp being driven off into the sand dunes by machine gun fire. During, November and December much valuable information of the desert routes in the Coastal Section was obtained by patrols. In the Moghara Section several attempts were made by the light car patrols to find a practicable route to the El Qara Oasis, but the boggy ground and high sand dunes on each occasion defeated the attempt. Towards the end of November an interesting and useful reconnaissance was made from Aswan through the Kurkur Oasis to Beris, on the southernmost end of the Kharga Oasis. The total distance covered was 336 miles. 15. During the month of January I received intelligence that Sayed Ahmed, the Grand Senussi, with his Commander-in-Chief, Mohammed Saleh, whose force amounted to some 1,200 men, were making preparations to depart from the .Siwa Oasis and to retire to Jaghbub. With the intention of capturing Sayed Ahmed if possible, and of inflicting as much loss as possible on his followers, I gave orders on the 21st January that operations were to be undertaken against the Siwa and Girba Oases at the earliest possible moment by a mixed force, to consist of Imperial Camel Companies and armoured cars. Preparations for the march of such a force, however, over the 200 miles of waterless desert between Mersa Matruh and Siwa would have taken at least one month, and the expenditure of so much time was put out of the question by a reliable report received towards the end of the month that Sayed Ahmed and his followers were on the point of leaving Siwa. I therefore ordered an immediate reconnaissance of the Siwa and Girba Oases to be undertaken by a column consisting entirely of armoured motor cars, and supplied by motor transport based on Mersa Matruh, with the object of verifying the above report, and of inflicting as much loss as possible on such part of the enemy forces as might be met with. Command of this column was entrusted to Brigadier-General H. W. Hodgson, C.V.O., C.B., whose plan was to attack the enemy camp at Girba with his main body, and to detach two armoured motor batteries to block the pass at Garet-el-Munasib — the only pass between Siwa and Jaghbub practicable for camels—so that should Sayed Ahmed, as was probable, take to flight, casualties might be inflicted on his retreating column by the detached batteries, and his march be deflected into the waterless sand-dunes. 16. The fighting force of three light armoured batteries and three light car patrols was concentrated at Mersa Matruh by the evening of the 29th January. Owing, however, to a severe sandstorm, some of the heavy lorries of the heavy supply column did not arrive there from Dabaa till the 31st. The light supply column moved out from Mersa Matruh on the same day, and the fighting force moved out early the following morning. The column, having halted for the night on the road, moved to the point of concentration half-way between Gebel Lamlaz and Neqb el Shegga Pass, 185 miles from Matruh. This long march over the desert track was carried out in good time, and all units reached the point of concentration on 2nd February. After a reconnaissance towards the Siwa Oasis, orders were given for an advance on Girba—at the western end of the Siwa Oasis— on the following day, and for the move of the detachment allotted to block the Munasib Pass. By 9 a.m. on 3rd February all units had successfully descended the pass north-east of Girba and moved off to the attack, the advanced guard being divided into three parties of two armoured cars each, one of which was to attack each of the three enemy camps already located. The enemy was located in rough ground close under the rocky escarpment; he was completely surprised by the arrival of the armoured cars, and thrown into considerable confusion. Brisk fire was opened on the enemy, who at once took to the cliffs and rocks beyond the camps and returned our fire. The advanced guard was now reinforced, but, owing to the very rough nature of the country, it was impossible for the cars to approach nearer than a distance of 800 yards from the enemy without serious risk of getting stuck. As the action progressed, it became evident that the enemy, who was engaging the armoured cars with two guns and two machine guns, was in considerable force and did not intend to retire without a fight. Information obtained from deserters showed that the strength of the enemy at Girba was 850, while Sayed Ahmed, Mohammed Saleh, and some 400 or 500 men were at Siwa. As afterwards appeared, Mohammed Saleh left to take command at Girba at the beginning of the engagement, while Sayed Ahmed and his force made off to the westward. General Hodgson, who made skilful arrangements for extricating his force, in case of a threat directed by the Siwa party on his left flank and rear, continued the action all day. The light armoured cars, though unable to get closer than 400 yards from the enemy's position, kept the enemy under an accurate fire, inflicting some casualties. Towards evening the enemy's fire died down, though occasional bursts were fired from his machine guns during the night. At 5 a.m. on the 4th February the enemy fired four final rounds from his guns and several bursts of machine gun fire. Fires were seen beyond his camp, movements of men and animals could be distinguished, and the sounds of small arms ammunition being burnt were heard. By dawn he had completely evacuated his position. The rest of the day was spent in destroying the enemy's camp, reconnoitring towards Siwa and resting the troops, and on the following morning, 5th February, the column entered Siwa without opposition. A parade, at which the local sheikhs were assembled, was held before the court-house, and a salute of nine-guns fired with a Krupp gun that had been brought from Matruh in a motor lorry. Arrangements were then made for the collection of all rifles and for the repair of the passes leading down to the escarpment. The reception given to our troops by the inhabitants of the oasis was friendly, and reports from them confirmed the fact that the enemy had incurred considerable casualties. The column left the town on the same afternoon, and reached the point of concentration on the following day. Meanwhile, the Munassib detachment, consisting of armoured cars and a light car patrol, had reached its position on the evening of the 3rd February. It was found impossible to get the armoured cars down the steep escarpment, and they were forced to remain at a point 18 miles north of Munassib during the operations. The light car patrol and one car managed to get down the escarpment and take up a position at Munassib. On the 4th this detachment captured a small convoy of mailbags proceeding east to Siwa, and on the 5th it was able to intercept and cut up the leading parties of the enemy retreating from Girba. Subsequently, the enemy established a post out of reach of the cars, and warned all subsequent parties of the enemy to turn into the sand-dunes before reaching the pass. The detachment was therefore ordered to return to the point of concentration, as there was no chance of further successful action. The whole column returned to Matruh on the 8th February, having sustained no casualties to personnel beyond three officers slightly wounded, or to material besides the loss of one tender with broken springs. The enemy's losses were 40 killed, including two Senussi officers, and 200 wounded, including five Turkish officers; 70 rifles were brought in and 150 destroyed; 3,000 rounds of small arms ammunition were brought in and 2,000 destroyed, besides what was burnt by the enemy; 40 of the enemy's camels were killed, and a large number of shelters and tents were burnt. 17. Though the capture of Sayed Ahmed and Mohammed Saleh was wanting to the complete success of the operations, the fighting troops—supported most admirably by the supply column working under extremely arduous conditions—accomplished all that was possible under the circumstances, and great credit is due to General Hodgson and his staff. The expedition which, at my request, was accompanied by Captain Caccia, the Italian Military Attaché, dealt a rude blow to the moral of the Senussi, left the Grand Senussi himself painfully making his way to Jaghbub through the rugged and waterless dunes, and freed my western front from the menace of his forces. On 14th February No. 2 Light Armoured Car Battery left Sollum to reconnoitre the road to Melfa. During this reconnaissance two enemy caravans were met and destroyed. 18. The outstanding features of the period covered by this despatch have been, on the eastern front the rapid progress of the railways, and on the western front the work of the armoured cars. For the speed at which the railway has been pushed out along the desert to El Arish and beyond, the greatest credit is due to Colonel Sir G. Macauley, K.C.M.G., C.B., Director of Railways, the officers of his staff, and the officers and men of the railway companies. In spite of endless difficulties owing to heavy sand and lack of water, they maintained by their strenuous efforts a rate of advance which was not far behind that of the fighting troops, and were largely instrumental in enabling the latter to keep the enemy under a continual pressure. I have already referred to the excellent work of the armoured cars and light car patrols on the western front. Their mobility, and the skill and energy with which they are handled, have made them an ideal arm for the western desert, where the sand is not so heavy as on the east. It is not too much to say that the successful clearance of the western oases and the satisfactory state of affairs which now exists on the western front is due more to the dash and enterprise of the armoured car batteries and the light car patrols than to any other cause, and the enemy has found many times to his cost that their range of action is far beyond that of any troops mounted on horses or camels. The work of the Imperial Camel Corps has been excellent throughout. This corps includes Australian, New Zealand and Imperial units, and the efficiency of the camel companies is largely due to the efforts of the instructional staff at the headquarters of the corps at Abbassia, which has been continuously engaged in their training. A great deal of the work of supplying the troops on both fronts has been done by the Camel Transport Corps, a unit which has been raised in this country since the commencement of operations, and which has invariably carried out its duties with the utmost efficiency. The execution of the enormous amount of work necessitated by our advance on the eastern front would have been quite impossible had it not been for the Egyptian Labour Corps, which began to be recruited in this country early in 1916. The officers of this Corps (have been largely found among gentlemen who are resident in this country and are familiar with the language and customs of the population. My relations with the High Commissioner, General Sir F. E. Wingate, G.C.B., G.C.V.O., K.C.M.G., D.S.O., have always been most cordial, and I should like to express my gratitude for his ready assistance and valuable advice which have always been at my disposal. I also wish to express my grateful appreciation of the services of all the officers employed as King's Messengers. The risks involved were not small, as is proved by the fact that one officer was drowned and another, when his ship was torpedoed, was forced to sink his despatches; nevertheless, this duty has always been faithfully and efficiently performed. I have, in a former despatch, referred to the admirable work of the Red Cross and Order of St. John in this country, under the direction of Sir Courtauld Thomson, C.B. I desire now to express my obligation to those ladies and gentlemen who have given voluntary aid in connection with these institutions, and who lave worked with a devotion deserving of the highest praise, in the interests of the sick and wounded. Not only have they earned the gratitude of the individuals they looked after, but also they deserve the thanks of their country, as they have materially contributed towards the rapid convalescence and, therefore, to the maintenance of the fighting efficiency of the forces under my command. The operations which I have had the honour to describe in this despatch, and which have resulted in the freeing of Egyptian territory of all formed bodies of the enemy, could not have been successfully carried out by the forces in the field but for the devotion, energy and skill of the Headquarters Staff and Heads of the Administrative Services. I have on previous occasions expressed my appreciation of the able manner in which Major-General A. L. Lynden Bell, C.B., C.M.G., Chief of the General Staff, has discharged his duties. I wish again to bring this officer prominently to notice for his admirable work during the period under review. The abolition of the Inspector-Generalship, Lines of Communication, has thrown upon my Deputy Quartermaster-General, Major-General W. Campbell, C.B., D.S.O., and my Deputy Adjutant-General, Major-General J. Adye, C.B., the whole of the work previously performed by the Inspector-General of Communications, and these duties they have had to discharge in addition to the normal work in connection with an Army in the Field. The Eastward advance has also now lengthened the lines of communication to something like 200 miles. I wish, therefore, specially to acknowledge the excellent work done by these two officers', and I shall have the pleasure of bringing before you the names of a number of Officers of the Administrative Services in this connection. I wish to bring to your notice the excellent manner in which my Assistant Military Secretary, Lieutenant-Colonel S. H. Pollen, C.M.G., has performed the exceptionally heavy work of his department. A list of those Officers, Non-commissioned officers and men whom I desire to bring to your special notice in connection with these operations will be forwarded at an early date.